Check out how the hybrid technology, found in AO Smith Voltex water heaters delivers great benefits and lots of savings to the homeowners - including water heating, cooling and dehumidifying the surrounding air. This article reviews the positives and negatives found in the Voltex heat pumps from AO Smith. Voltex series is the group of hybrid water heaters that utilize both electric technology and heat pump integrated into the top of the tank. The heat pump technology is used as the primary source for the high-efficient water heating, while the set of two electric heating elements is utilized as the backup and for faster hot water recovery. Models from HPTU series, for example, are dual voltage capable so they can operate using 208 and 240 volts. The combined, hybrid water heating is what makes AO Smith Voltex ultra efficient while the increased storage enables plenty of hot water when there the demand is high. Such a design brings the operating costs down, which is over 70% in energy savings. The major difference between the AO Smith and its competitors is that Voltex is built in three sizes (most others have only one), and utilize storage tanks with the greater capacity than main competitors GeoSpring from GE and Rheem. AO Smith electric heat pumps are available in tank sizes of 50, 66 and 80 gallons, serving up to 5 showers used simultaneously, with the maximum energy factor of 3.24 making the unit very efficient and Energy Star approved. According to the manufacturer, the Voltex provides savings of approximately $350 per annum or $3500 during the provided warranty of 10 years. All three sizes mentioned above are found in two of the three available categories; HPTU and FHPT while only one, 80-gal unit, comes from the HHPT series. If planning to connect your hybrid water heater to the home management applications via the communication port, HPTU and FHPT series have it. HHPT model has an advanced electronic user interface that comes with the larger LCD display, status icons, and safety lock features, while on HPTU and FHPT, the user interface uses the smaller display and has the diode indicators. When comparing the 80-gal models, HPTU-80 is a taller model, has the highest efficiency of 3.27 and first-hour rating of 95 gallons. The HHPT-80 model comes with the short 6-year warranty while others have 10 years. High Efficiency mode uses the heat pump technology only for water heating and maximum efficiency. Hybrid mode - water heater utilizes the heat pump for efficiency and heating elements for faster recovery during the high hot water demand. Electric mode - this is the mode when only heating elements operate. It is recommended to use the electric-power heating during the periods of cold weather as the heat pump operates with the min. efficiency. Backup electric elements consist of the lower 2 kW and upper 4.5 kW elements, both protected from dry firing. Vacation mode - is the mode used during the period of absence such as vacation. This is when the unit is more inactive than active, which reduces the operating costs to the minimum while protecting it during the cold freezing days. AO Smith Voltex is the green product, it uses the environment-friendly refrigerant and has high efficient heating - so there is less waste. The heat pumps can provide the same amount of hot water as the traditional tank-type model – and is meant for family sizes of four and up, all that for less money. Another great element that is installed in Voltex heat pumps of the HHPT series is the non-sacrificial powered anode rod, which protects the metal tank from corrosion while extending its life. HPTU and FHPT use the heavy duty anode for longer protection but are still sacrificial, that has to be replaced and maintain regularly. AO Smith uses the computerized system that makes the usage more convenient, reliable and safer. By using the control panel, push-buttons and its large LCD display as seen on HHPT model, you will have an access to the diagnostics system with the error codes, temperature control, mode selection and other useful features. On the LCD display, you can see the heating element or heat-pump functioning icon, set temperature in C or F, the efficiency status, mode indicator and the panel lock icon. There are two main complaints that are found in user reviews about AO Smith Voltex; the noise and the high upfront cost. The complaint about the noise was coming from the users whose heat pump was installed either in the closet or attached garage, close to the bedroom. As for the other negative complaints, yes, the units are expensive but according to the manufacturer and presented savings, it seems that the unit pays for itself in two to four years. 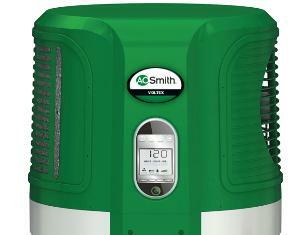 AO Smith Voltex heat pump is an ideal choice for larger families, where the electricity is the only power source. It is more expensive than the electric unit, but it is also more than twice as efficient and is usually eligible for all kinds of savings, such as the utility company rebates or federal tax breaks. This is the only electric water heater that comes with the increase thermal efficiency and Energy Star approval. It takes the similar footprint as the standard models and the installation is as easy. It can be very beneficial if installed in rooms with higher temperature (attic, technical room with a furnace or boiler) as it is cooling and dehumidifying the surrounding air.